It’s late September and Paul Wright is in a wet and blustery London. “Aye, man, no bad,” he says in his soft Scottish brogue when I ask him how his day’s going, “I’m inside at least.” Watching Wright’s debut feature, For Those In Peril, you’d think he’d be quite at home in the dreich, given that he makes such good use of the wind-lashed coastal landscapes around where he filmed in Gordon, Aberdeenshire. It’s the kind of village the director knows well, having grown up in Lower Largo in Fife. Was it his formative years in a close-knit fishing community that drew him to centre his first full-length film on the aftermath of a tragedy onboard a fishing trawler? 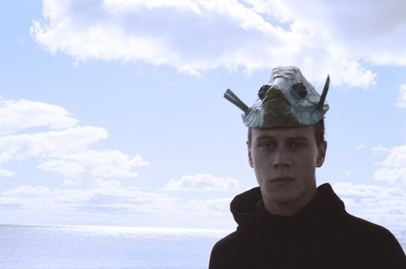 It’s a story floating around a character’s head – specifically that of the film’s protagonist Aaron (an extraordinary George MacKay), the 18-year-old sole surviver of a boat that goes down at sea, claiming the lives of five local lads, including Aaron’s older brother Billy (played by Conor McCarron in flashback) – that drives For Those In Peril’s narrative; it’s a bedtime fable his mother (Kate Dickie) used to read to him as a child about a devil who lives at the bottom of the sea and who swallows sailors whole. Aaron, in his post-traumatic anguish, believes that if he can slay this beast, like a young boy does in the fable, then he can bring his brother back from the depths of the drink. The power of For Those In Peril comes not from the narrative itself, which is a rather modest one about grief and loss, but from the way it’s visualised. Over its 93 minutes, Wright plunges us into Aaron’s confused state. You become marinaded in his emotions and his environment; you’ll be checking your pockets for sea water as you leave the cinema. This intense storytelling is achieved by Wright’s singular style, which has been developed and honed through a trio of bracing short films, including BAFTA 2011-winner Until the River Runs Red. “I’ve always really been interested in images and sound and how you can play with them to make an emotional impact,” he says. What’s so pleasing about this sensory experience is that its meanings and emotions aren’t telegraphed in. The sound and image is often disjointed and contradictory. There’s a feeling that your neighbours in the dark of the auditorium are having a completely different relationship to what’s on screen than you are.